We were listening to the Bhagavad Gita being chanted, and i put it on for a reason. The Bhagavad Gita is pretty much all you would ever really need to follow the path of Yoga. Its name means the “Song of God,” and it is a sacred text at the heart a larger epic – the Mahabharata. So the story opens as a dialogue between the hero, Arjuna, and his friend Krishna. It turns out that Krishna is the Avatar, God incarnate, but Arjuna knows him only as his friend and charioteer. The first chapter of the Bhagavad Gita is called “The Depression of Arjuna” (“Arjun Vishad” in Sanskrit) and here’s the set up: Arjuna asks Krishna to drive the chariot to the center of the battlefield on the eve of a great world war. It is a war involving cousin against cousin and for the first time, Arjuna takes in the reality of the situation, and loses his drive and motivation completely – he’s incapacitated. His reason tells him that there is no good outcome here; he doesnt want to ‘win’ nor would he want to lose the war, so he sits down right there and decides not to fight at all. A primordial existential crisis: Whats the point, what do i really want and what is right or wrong? And his response is complete paralysis, a little like Shakespeare’s Hamlet. He is speaking there of symptoms typical of the over-aroused sympathetic nervous system, the stress response. We all know the experience of anxiety and depression, some of us more than others. One of the patients i work with in a psychiatry practice just spoke to me yesterday. Her long term depression was beginning to lift. That was how she put it – “something has lifted” – and i knew she was telling the truth because she started to ask how i was, and to inquire about me. In the three years we had known each other she had never done that. This concern for others was a sign that she really was starting to snap out of it, and i was so glad! It was interesting she used that spatial metaphor: something ‘lifted’. 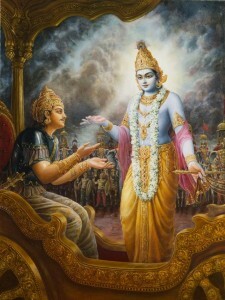 That’s what Krishna does for Arjuna, he uplifts him through the teachings of Yoga. He takes the role of Guru and tells him “Utthistha, Arjuna!” Get up, Arjuna! Offer your every action as selfless service to the highest principle and you will be free. Unselfish acts are known help to bring one out of depression. Krishna explains how every mundane thing you do can be done as an offering with no selfish attachment. The word depression implies a pressured, downward motion. Yoga involves this emotional effort to arise. It is the heroic skill of rising to the occasion, even when the occasion requires you to face what you dread or to fight for all your worth. In facing the truth, the hard realities here on earth, it takes effort to resist the downward force, that negative gravitational pull, but there is something about life, the life force itself, which goes up, which arises. We see this everywhere in nature. There is an apt aphorism from the Shiva Sutra: Udhyamo Bhairava meaning, “God is arising.” One effect of Hatha yoga is to sensitize us to the flow of ‘uddiyana’ prana, the aspect of prana which continuously flows upward and outward. We can actually feel the brilliant, enthusiastic life force flowing up through us. This constantly emerging prana is called nityodita, meaning, eternally arising. Yoga is a satisfying path of paradox. One thing about this spiritually striving to ascend is that it is preceded by going deep within, in fact, mentally descending, going down into the dark foundation of our being. We hear about the process of healing being initiated by “hitting bottom.” This also reminds us of the parable of the prodigal son. He had hit bottom, squandered his inheritance and was literally reduced to digging a pit, when it occurred to him, wait a minute, “I will arise, and go to my father….” In order to rise in this world, it is often the case that we must hit bottom, like a ball being bounced against the hard earth to be propelled upward, or the roots of a tree extending down before it grows up. This is basic physics. Hatha Yoga takes this principle into account, and is all about the commitment of being grounded on the earth plane, and letting the energy emerge from there. We can express the downward extending energy as a full in-breath, which is a form of commitment to what is real. Maybe this is why some people put themselves into “at risk” situations in life, for the fun of it, for the joy of having a singular intention – to survive. The use of the pranayama we call “kumbhak” which involves holding the breath either out or in, results in a cascade of this dopamine, the mood chemistry of motivation and drive, “joie de vivre.” Even better, kumbhak pranayama can give us an instantaneous taste of samadhi, the liberated thought free state. When people speak of ‘something lifting’ and coming out of depression, that is an inkling of the fact that the way to obtain joy and happiness is to have something removed, that liberation is not another acquisition, but a release. The thought free state experienced after the practice of kumbhak is a moment of communion with that innate freedom. It is a cleaning of the slate. There is another element involved though, in this effort to rise and that is Grace. Remember the aphorism “God is arising” (Udhyamo Bhariava) from the Shiva Sutra? The one that follows states Guru Upaya, meaning “The Guru is the means.” The Guru is the divine power of Grace that reaches down to uplift us, to remove our mind-borne burdens, when we choose to make the self-effort. One of the names of Krishna is “Hari,” meaning, thief. The One who steals sorrow and depression. Lets begin with kumbhak pranayama now, and from there, by means of Grace, we will arise.